Passiflora Linnaeus (1753: 955) is a genus that could be easily used to demonstrate the need of taxonomic studies for several further groups of plants in the Amazon. As a result of only a few isolated taxonomic studies in the Brazilian Amazon, the number of new species of Passiflora recently increased as showed by Koch et al. (2013, 2014), as well as the register of new records. During the activities of the project “Survey and Scientific exploration of the Flora of the UHE Belo Monte” in the Xingu region, several individuals of a Passiflora of the series Serratifoliae Killip ex Cervi (1997: 30) were found. The specimens morphologically resemble P. malacophylla Masters (1872: 563), but proved to belong to a new species. 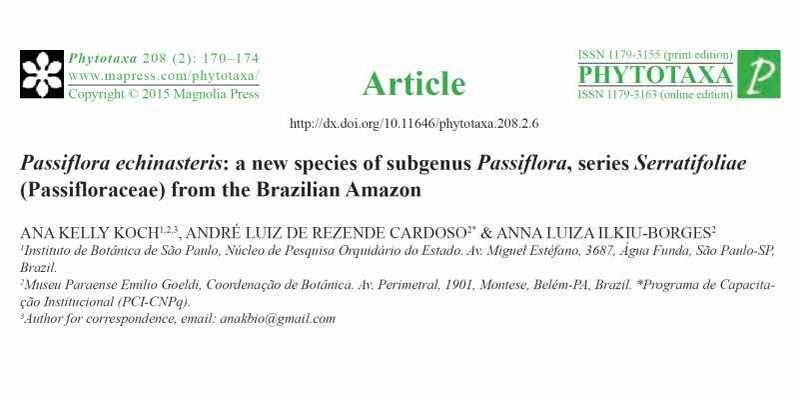 The aim of this paper is to describe this new species of Passiflora from the Brazilian Amazon. RUA 86-C, 64, Setor Sul, CEP 74083-360, Goiânia-GO, Brasil. © 2018 Biota Projetos e Consultoria Ambiental Ltda.